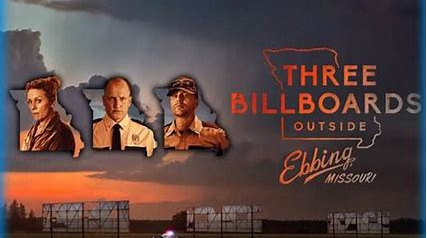 Even though today’s Oscar Nominations are carrying the elegiac headline “Martin McDonagh Snubbed for Directing Three Billboards,” I saw it again before all this happened, and had such an rapturous experience I had just had to write about it. AGAIN. 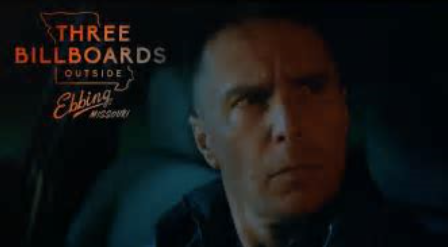 You really DO have to see this film twice, at least,to get what is really going on in this incredibly rich, dense screenplay that McDonagh has graced us with. I found it soooo moving all over again. And perhaps this time, it was because I was looking at it from the perspective, that yes, this is a gay story. Or is it? 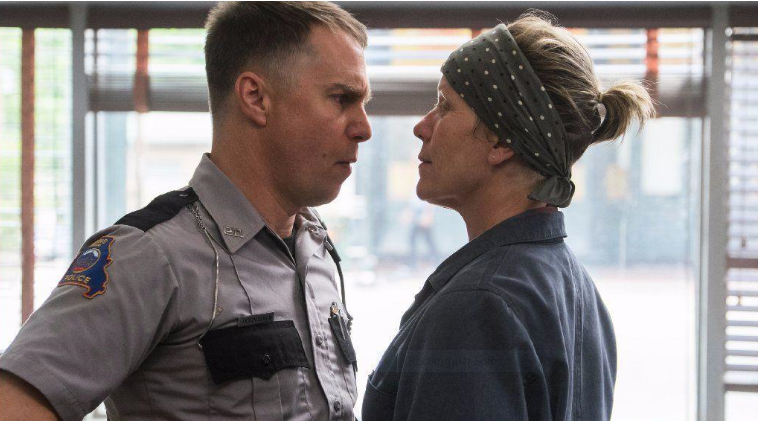 He’s totally confused and his youthful energy and rage knows no outlets, except beating up his prisoners, and he seems so randomly violent, at times you think that HE’s the killer of McDormand’s teenage daughter. You think that about Harrelson, too. 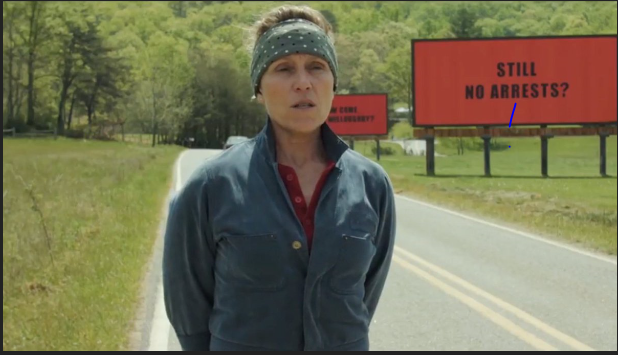 Everyone is under suspicion in “Three Billboards.” And I didn’t notice the resemblance between McDormand and his mother’s character, with the close-cropped, dyed, blonde hair (pictured below). The actress who plays his mother so well is Riya May Atwood. 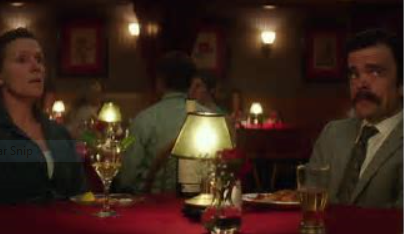 I found that last scene so incredibly moving. And it’s so, so simple. How can I explain it without spoiling the main dynamic of the film? Except to say that everything takes another amazing twist. And you really have to be ready for it. 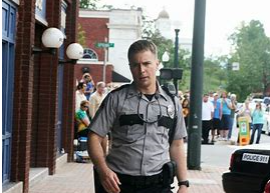 Dixon needs to find SOMEone to talk to, someone who understands his violent rages. And she does. Seeing it twice, I was captivated. Are they villains? Are they murderers? Or could they be? 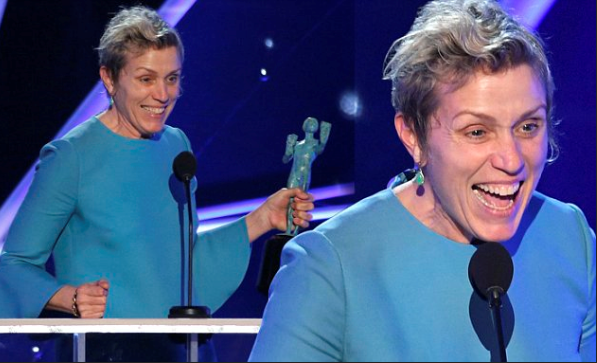 And the acting by McDormand and Rockwell is mesmerizing and fine in the extreme. It’s a master class of understatement. They hypnotize you, as each hypnotize each other. Their acting is very, very rare indeed. It is off the charts. She’s so bereft cannot cry. Her grief is ineffable. And her rage! Which fuels the movie with explosions literally and figuratively, that take the same form as Rockwell’s incomparable, terrifying outbursts, and I can’t wait to see it again! May they all continue to be showered with Oscars!